December is a month filled with lots of fun, food and festivities and that means that in my life the gym takes a backseat. In order to treat myself during the Christmas period I have decided to take part in the Party Hard, Train Harder challenge. If you've not heard of this challenge, in a nutshell I'm going to do 10,000 steps every day in January in order to allow myself to party and enjoy the festive season and work it all off in January. New year; new start, right?! 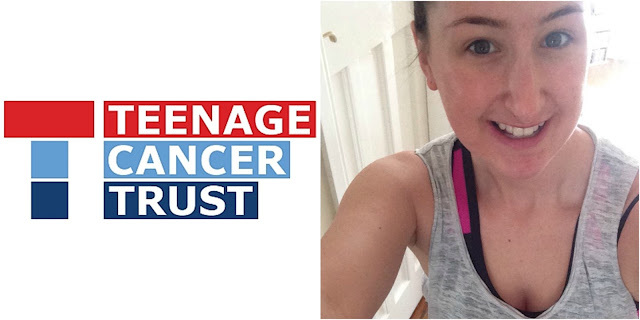 One of my goals for 2018 is to get back into my fitness and I couldn't think of a better way than to do so whilst trying to raise some money for Teenage Cancer Trust. I've decided to commit now and use this motivation to raise some money for such an important cause. Most of you will have probably heard of the Teenage Cancer Trust, but for those of you who haven't then it's basically a charity in the UK that supports young people aged 13-24 who have been diagnosed with Cancer. It's such an important cause and SO many young people are affected by the horrible disease that is Cancer so if anyone can spare anything to help support the work that they do that would be amazing. I'm aiming to try and raise £250.00 over the course of the month and hopefully by the end of January I'll feel fitter and healthier and will have helped to raise vital funds for such a special cause. If you want to join the party, head on over to the Teenage Cancer Trust's page and sign up! There are SO many ways we can raise money for this cause - I'm thinking of hosting a little Festive fuddle and inviting some friends over for a party and ask them all to donate to the charity! If you want to donate to my page then I'd really appreciate it and would love your support!